Open a tackle box of an angler over 40 years old and the odds are high you'll find an Al's Goldfish. The pioneering spoon has been a go-to lure since Al Stuart developed it in 1952. The spoon was first launched through Stuart's Sports Shop in Indian Orchard, Massachusetts. Stuart later added a distribution network along with a consumer-direct catalog. He continued to make lures, expand his product design and promote his products until his passing in 1984. Al's Goldfish remained a family-owned company run by Al's daughter Joan and her husband Fay. The couple focused their attention on the promotional end of the business. As the late 70's through mid 90's saw a change in customer tastes and preferences, Al's Goldfish lost its brand appeal. Ultimately Joan and Fay retired and sold the business to John Occhialini. 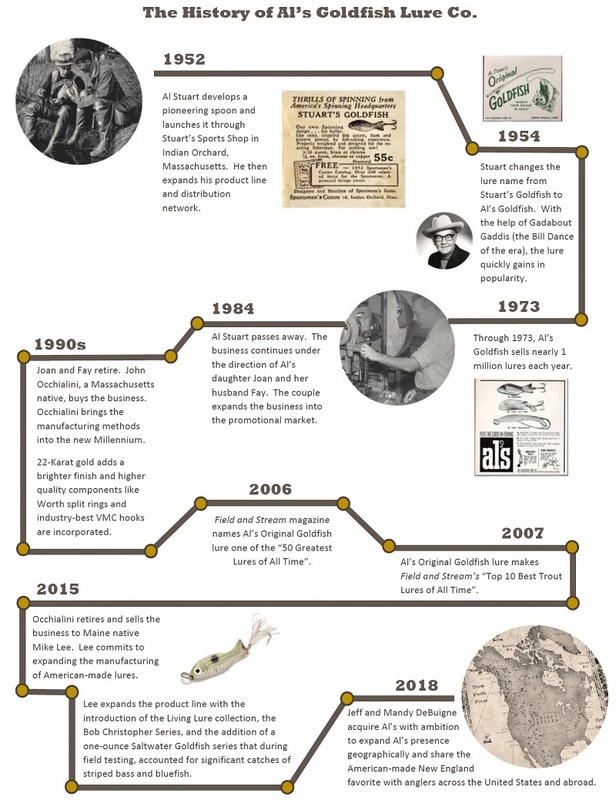 The Massachusetts native was the first non-family member to own the company, and Occhialini brought Al's Goldfish into the new Millennium. The 1950's stamping machinery, which was state-of-the-art at the time, was replaced with better methods that improved lure quality. 22-Karat Gold plating added a brighter finish, and higher-quality components like Worth split rings and industry-best VMC hooks were incorporated. Occhialini computerized all business operations while expanding catalog and marketing efforts. Sales and profitability returned. Upon Occhialini's 2015 retirement, Maine's Mike Lee became the fourth owner of Al's Goldfish. His objective was to expand the manufacturing of American-made lures. In 2016 Lee added the Living Lure Collection which features vibrant fish images over a chip-resistant finish. Next he added the Bob Christopher Series, a combination of attractor and imitator spoons that mimic common baitfish. And most recently he introduced the one-ounce Saltwater Goldfish series that, during field testing, accounted for significant catches of striped bass and bluefish. With these assortments Lee focused on continued sales growth while simultaneously expanding the domestic workforce. In 2018, Jeff and Mandy DeBuigne, who have lived on both the West and East coasts, acquired Al's with the ambition of expanding Al's presence geographically and sharing the American-made versatile Goldfish with anglers across the United States and abroad. Al's Goldfish lure's unique design is aero-dynamic which makes for easy casting on even a windy day. Its distinctive shape causes it to swim naturally with a smooth retrieve or to dart-erratically when twitched. Gold, nickel and copper blanks are polished to a perfect hue, and they readily accept paint. Many lures are hand-painted and hand-finished. There are between three and five colors of paint matched with between one and three baking processes. 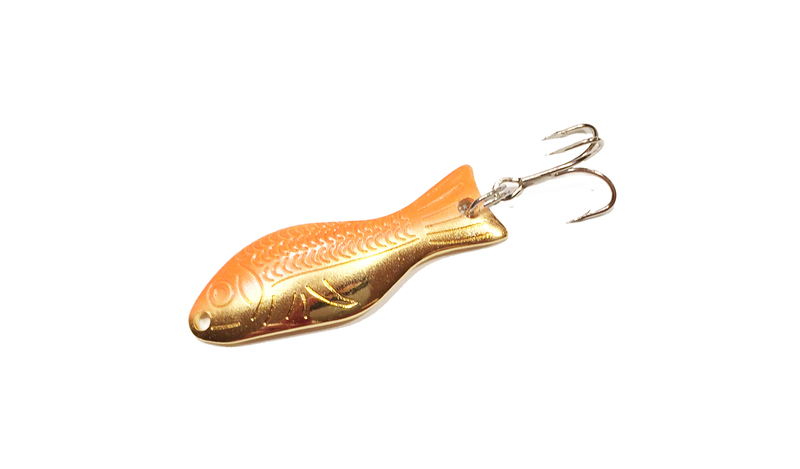 The clear finish protects the colors from chipping and makes the lures virtually indestructible. From 1953 through 1973, Al's Goldfish sold nearly 1 million lures each year. At least one is in your dad or granddad's tackle box. The original name for the lure was Stuart's Goldfish. It was renamed Al's Goldfish in 1954 and promoted by Gadabout Gaddis, the Bill Dance of the era. Al's Goldfish lures will catch any fish that swims. Sure they're great on trout, but they also account for several different species of bass, panfish, walleye, pike, and muskie. Saltwater fish such as striped bass, bluefish, redfish, sea-trout and Pacific salmon hammer the spoons. Al's Goldfish lures have always been Made In America. The blanks are made in Massachusetts, the paint is applied in Rhode Island, the split rings are made in Wisconsin, and the company headquarters is in Maine. In 2006, Field and Stream magazine named Al's Original Goldfish lure one of the "50 Greatest Lures of All Time". In 2007, the lure was made Field and Stream's Top 10 Best Trout Lures of all time. All lures are hand-painted with hand-mixed color schemes. Depending on the lure they are baked between one and three times. Their hard finish makes them durable and protects paint colors from chipping. Each hand-made Al's Goldfish lure requires between 6 and 8 minutes of work per lure. 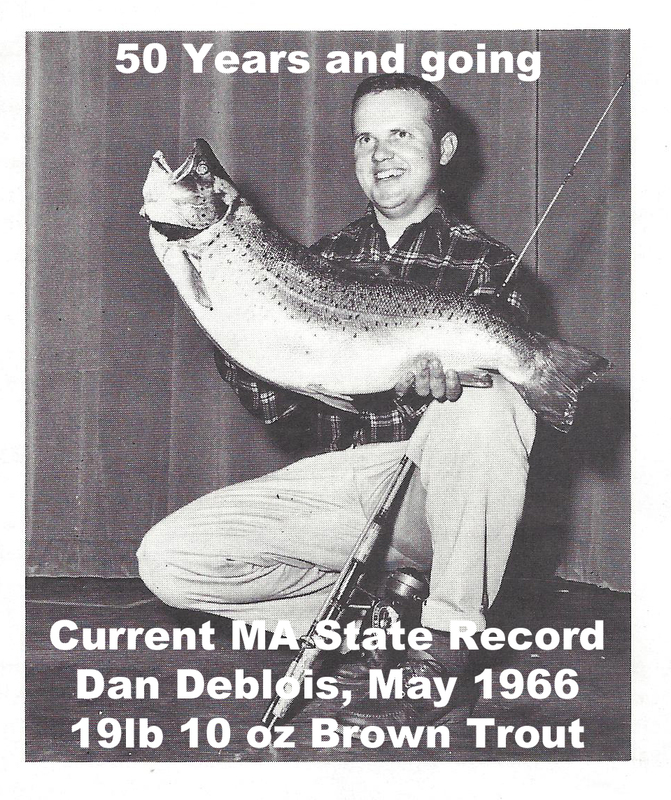 The Al's Goldfish continues to hold the Massachusetts state record for largest brown trout ever recorded. The beast was caught by Dana Deblois in the Wachusset Reservoir in May of 1966 with the Gold Orange 1/4 oz goldfish. It continues to be the longest standing state record today. Al's Goldfish has recently been featured in a number of outdoor publications including: Field and Stream, Outdoor Life, Fishing Tackle Retailer, Fishing Tackle Trade News, Fishwrapwriter.com, Bassin' Magazine, On the Water, The Maine Sportsman, The Norwich Bulletin, The Bangor Daily News, Adventure Sports Outdoors, and Outdoors Unlimited Magazine. I swear by your lures! Been using them for forever! I had a buddy of mine tell me this lure wouldn't work (Living Lure Perch). Well after 5 good fish...hahaha, boy do I love this lure. 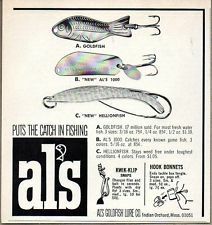 I've been using the Al's Goldfish Lure for years over 50 years. The Al's Goldfish 1/4 oz is the very best lure I have ever used for brook trout bar none. The bucktail plan was a HUGE success. Two of us kayaked into a tough west wind and in a few hours we landed more than thirty bass up to 27". Your Goldfish was perfect, and the stripers hit it aggressively. Well done, that lure was a blast to fish, especially on light tackle. I can't wait to fish that Goldfish again! It's like witnessing the reincarnation of an old fishing buddy.